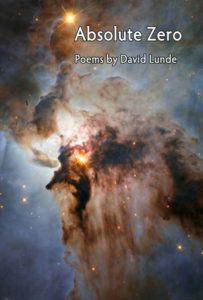 Veteran poet David Lunde’s newest work, Absolute Zero, paints an always fantastic, often tender, and occasionally frightening portrait of humanity’s place among the stars. Lunde has a gift for distilling great expanses of time and space into a single poem, an ability that makes sitting down with his work feel like strapping in for an intergalactic journey. Throughout the voyage, Lunde finds a strange humanity in both the cosmic and the microscopic: black holes resemble Shakespeare characters, subatomic love stories rise out of quantum foam, and stars live and die just like us. Whether exploring bacterial empires or brewing the first beer on Mars, Lunde’s cerebral verses are always delivered with a remarkable humor, wit, and charm that is sure to satisfy science fiction devotees and poetry lovers alike. If you are looking for imaginative and insightful speculative poems rich in science and science fiction, you’ll find a mother lode in this collection. I’ve been reading David Lunde’s work for more than thirty years and he never disappoints. Absolute Zero may be his best book to date and is certain to be an Elgin Award contender. My highest recommendation. Buy it, make room on your shelf! You’re in for a marvelous ride. Both science fiction and poetry, the one textually reductive, the other thematically expansive, proceed by metaphor. They find crawlspaces between what we think we know and the fullness of experience, crawlspaces where for a time we can dwell in wonder at the beauty, diversity and mystery of the many worlds that inhabit us. Dave Lunde knows those worlds, and that mystery. Each of his poems is a story, a small engine. like bright carrots in a soup. “Poems about stars?” I mumbled. not even a neutrino could penetrate. David Lunde graduated from his post-graduate studies at the University of Iowa Writer’s Workshop at the top of his class and received the Academy of American Poets Prize. He had been supporting himself and paying his tuition by inking charts and graphs of information received from instruments launched into space by JPL for Dr. James Van Allen, director of the Physics and Astronomy Department. Immediately after graduating, he was offered a teaching position in English and Creative Writing at the State University of New York at Fredonia, where he taught for 34 years. He is the author of nine books of poetry and co-translator of five collections of Chinese poetry, one of which won the PEN USA Translation Award. His poems have been published in 34 anthologies and in several hundred magazines. Mayapple Press has previously published The Grandson of Heinrich Schliemann & Other Truths and Fictions (2014), Instead (2007), and Blues for Port City (1995).